This entry was posted on Thursday, May 6th, 2010 at 4:49 pm	and is filed under About Anne, Drawing and painting, Free online drawing & painting tutorials, Right brain / left brain in drawing. You can follow any responses to this entry through the RSS 2.0 feed. You can skip to the end and leave a response. Pinging is currently not allowed. i did not like your pictures you had. Tell me more. Why didn’t you like the pictures? What were you looking for? This is a brilliant post. I’ve had the identical experience. I spent years hauling anatomy books around with me. There came a day though that I let them go. That was day I started actually, truly, drawing. Thanks for letting me know about your experience! I’d love to see your work – can you share links? Don’t forget that Da Vinci was doing what he was doing particularly because he was trying to rediscover the essence classical architecture and ancient Roman sculpture. The tenets of those things are all steeped in geometry and “perfect” proportion. Sometimes people forget that the Renaissance was not just people making up art – they were actually TRYING to relearn methods from antiquity. It’s natural that your own personal approach will be different than Leonardo’s if you are not drawing on the same intent. 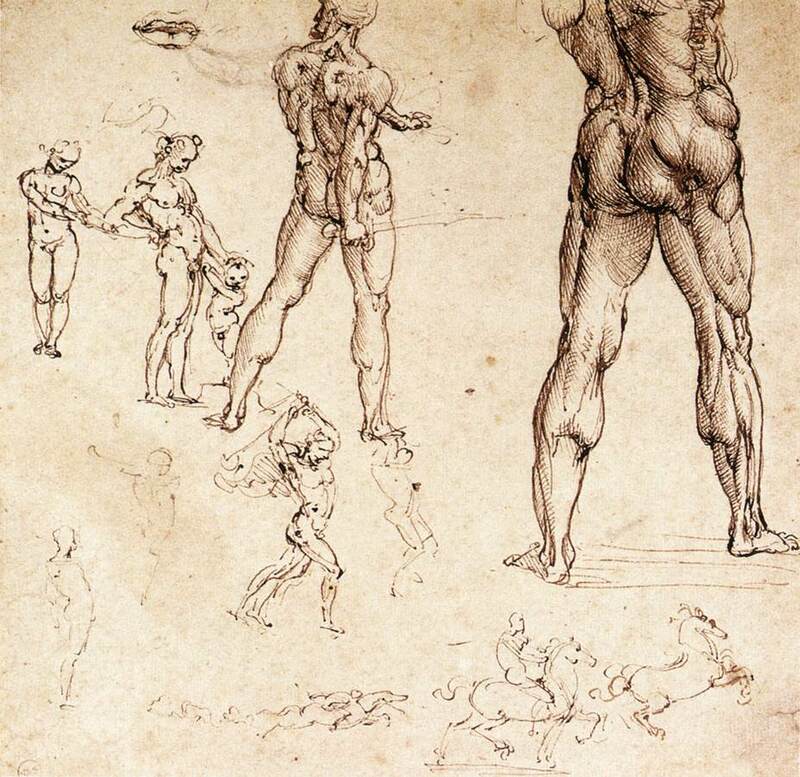 That said, Leonardo was just a fantastic drawer, period. Look at his self portrait that hangs in Turin. Except perhaps for the wave in his beard, this image has little to do with geometric proportions: just the true image of a man who had mastered living, but was realizing that life was ending. Thanks for posting about your experience. Art is such a rich activity. Thanks so much for your thoughtful comment, including placing Da Vinci’s tenets in historical perspective. By the way, I took a look around your website with its very cool mosaic – I’ve never seen a home page like that before! – and I like the way you generally set your thoughts in various contexts, including historical. I like your Guitar Player best of all your paintings, and I love the page of Memling portraits you link to – they are some of my favorite paintings too. I sent your Thankful cat page to my cat-loving daughter who just made a turbulent cross-country flight with her “special needs” cat. 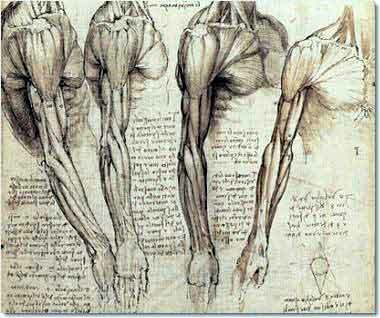 I agree with you that Da Vinci was an extraordinary drawer, and my post certainly wasn’t intended to argue against that – to me it goes without saying! You’re right that his goals were different than mine – he was a scientist as much as an artist, and wanted passionately to understand what were at that time the mysteries of human anatomy. As for my own experience, I experienced an increase in fluidity in drawing as I increased my level of understanding of perspective, much like how you described. Drawing just seemed to make more sense from then on. If you have never heard of him, I highly recommend checking out the work of Kim Jung Gi. His comprehension of perspective is so strong, that he can draw a person, car, animal, building – anything, really, from any angle, and beginning with the most bizarre of starting points ( for example, working from the finger tips up through the arm to the upper torso, head, then lower body, then place the figure on an elephant) and with zero construction lines, all ink. You’d swear the guy is tracing his images. Hi, Wanderer, it’s really interesting to hear about your drawing experience and what helped your fluidity increase. For me, fluidity increased dramatically when I forgot all about depth and began to see my subject as a flat jigsaw puzzle of shapes and colors. When I allow my “vision” to shift in this way and draw what I see, “magically” an accurate drawing of the fully 3-dimensional object appears. I believe this works because after all, the paper you’re drawing on doesn’t have depth – it’s flat. However, I wonder whether your brain works differently as you’re drawing than mine does, so that picturing your subject within space and perspective makes more sense to you. It would be interesting to know…. The issue is that the teachers aren’t teaching true davinci. Davinci drew what he saw. It was only later as he became advanced that he started analyzing the body. But we need to start where davinci started and where you are now at, drawing what you see, not what you are supposed to see. What an interesting comment, Marcus. Thanks! The thing is, if you draw *only* what you see, you’re basically an obsolete over-expensive, super-slow camera. “Drawing what you see” implies that there’s something right in front of you and you’re copying, not creating anything. It’s just variations of copying within squares in a grid. Knowing the three-dimensional structure of the objects we draw, in the other hand, allow us to create more freely, independently, than we could if we had always to depend in composing pictures almost exactly as we want in real life before our eyes, so we could “draw what we see”. Knowledge of how light behaves further improves on that, so these 3d structures can be convincingly painted. There are some painters who have an astounding, mind-boggling ability to paint what they see, but at the same time, they’re lacking in these aspects I mentioned, and consequently they end up with pictures that look like a mixture of crude paste-ups of photographs or and unconvincing scenarios, such as a “landscape” that actually looks like a poster right behind a model that posed for him in front of a wall with a landscape poster. Monsters that actually look *photorealistically* like miniature toys or papier-mache used as models. That’s not to say that “draw what you see” is useless; it’s necessary to build this repertoire of common 3d structures or to infer what they are and mentally move them, and even to see what the “visual” color of an object really is under a given light condition, rather than it’s “nominal”/abstract color under white light. But, of course, the more one decides to deviate from realistic depictions towards impressionism and abstraction, both things will lose importance accordingly. One can as well prioritize drawing what communicates the idea with an aesthetic that the author just likes for whatever reason. DS, you’re absolutely right in your comment! These tutorials are meant for the single purpose of learning to draw what’s in front of you, which is a skill many people would like to master. But I agree with you completely that what’s important in art is what an artist then does with that skill, the originality the artist brings to the work. Then of course there are artists whose art has nothing to do with realistic drawing. Thanks for your comment, Marianne. Leonardo was a genius, no question. I love the way he incorporated science and art. Your observation that he never drew bones first, with muscles added is interesting.